I am so excited to share the following journals with you! This journal is SO gorgeous!! 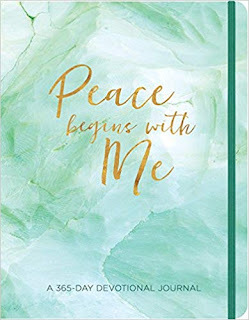 It's a year long journal that inspired me and is a feast for the eyes and heart! It's such a beautiful, high quality journal. The cover is a wonderful heavy-duty paper that can take a lot of abuse. It has a wonderful elastic band to keep it closed, as well. Each day starts with a beautiful quote then it has the devotional and instruction to read Scripture. I love that there is a lot of lined area on the page for writing my own notes or even drawing something that represents what I've learned. The paper is such high quality that I was able to use my colored pencils and pens inside without any real bleed through. There was some shadowing for the darker colors on the back side but nothing that over-shadowed the writing on the back side. It was so wonderful that each page was decorated with gorgeous flowers in the corner and a lined pattern at the bottom of the page. It is so gorgeous that it really speaks to my artistic soul. 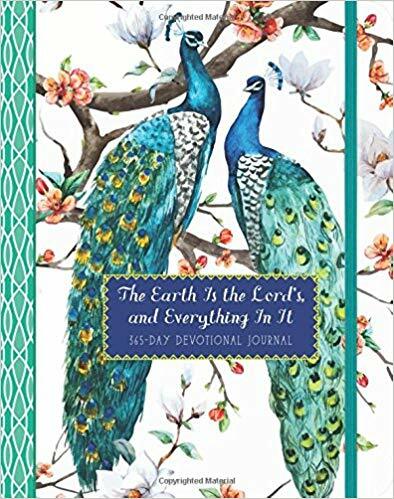 This journal is fantastic with wonderful Biblical teachings and lots of writing/drawing space. I absolutely love it and I think you will, too! This journal has to be one of the most gorgeous journals I've ever seen! The rich colors and amazing artwork inside absolutely enthralled me! 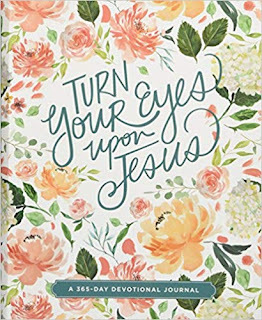 This is a year long devotional and journal that has a Scripture for each day and then an amazing devotional with a lot of lined space below for writing your thoughts about what you've read or for drawing in. The paper is such high quality and I was able to used my fine-line markers inside without any bleed through on the other side. I love the Biblical teachings with the short yet beautiful prayers each day as they made me really draw closer to God. The beautiful peacocks on every page were just so beautiful and made me feel so special just holding the journal in my hand. The cover is a heavy paper back with an elastic band for holding the journal closed. I liked that I could put the journal in my bag and not worry about it being damaged. 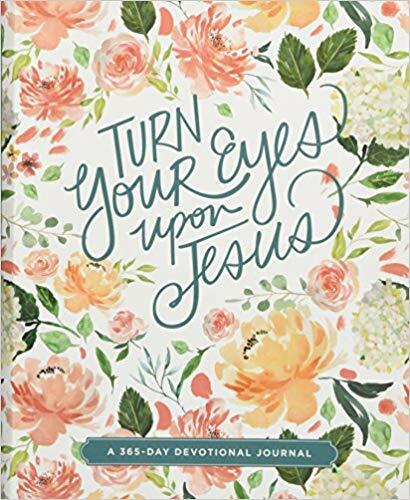 I love this journal and highly recommend it! This is another high quality journal that I love! The cover and inside pages are so beautiful with a watercolor affect. The inside pages have a marble looking band on each page that is so classic looking. The most important part is the amazing Biblical devotions. Each day starts with a Scripture followed by the devotion and ending in a prayer. Each one I read spoke to my heart and drew me closer to the Lord. There is also a large area on each page with lines for writing your thoughts or doing some art journaling. The paper is so nice that it was able to handle my felt-tipped pens with no problem and no bleed through. This is such a wonderful journal and I'm absolutely treasuring it. I know you'll love it as much as I do. Any of these journals would make a wonderful Christmas gift for yourself or someone on your Christmas list! They are all just wonderful! *These journals were provided to me by Worthy Publishing. I received a copy of these books to review but I was not financially compensated in any way. The opinions expressed are my own and are based on my observations while reading, drawing and writing in these journals.